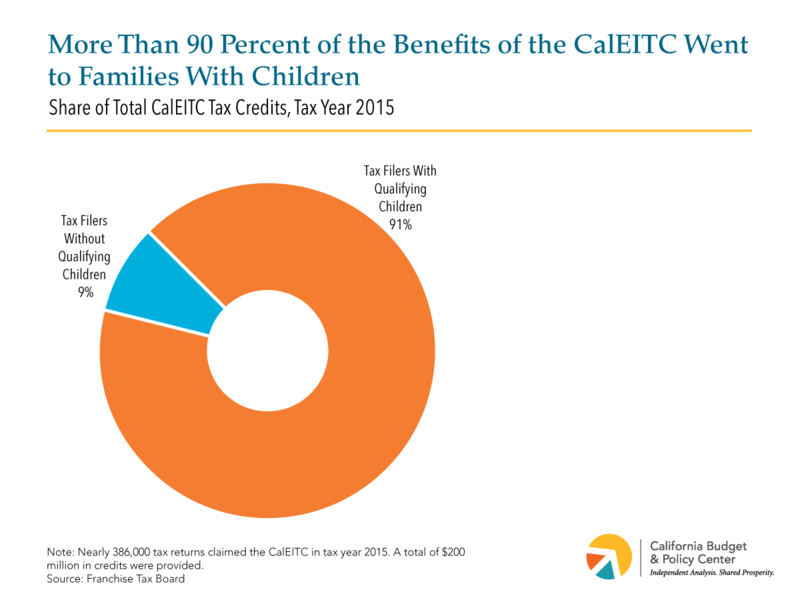 The CalEITC benefited around 815,000 Californians in tax year 2015, nearly half of whom were probably children. To arrive at these estimates, the FTB tallied the number of tax filers, spouses, and dependents listed on the 385,546 tax returns that received the CalEITC in tax year 2015. These returns included around 435,000 tax filers and their spouses, as well as more than 380,000 dependents. More than 9 in 10 CalEITC dollars went to families with children. Tax filers with qualifying children received 91 percent of the $200 million in CalEITC credits provided in tax year 2015, even though these families comprised just over half (56 percent) of the tax returns claiming the CalEITC. In contrast, just 9 percent of the aggregate CalEITC credits went to individuals without qualifying children — a group that represented 44 percent of all CalEITC claims. This disparity reflects the fact that the CalEITC is designed to provide much larger credits to families with children (up to $2,653 for people with three or more qualifying children in tax year 2015 versus a maximum of just $214 for people without qualifying children). Families with multiple children received an average credit of more than $1,000 from the CalEITC alone. The CalEITC provided an average credit of $520 in tax year 2015. However, people with qualifying children received much larger credits, on average: $1,159 for those with three or more children, $1,023 for those with two children, and $630 for those with one qualifying child. In contrast, the CalEITC provided an average credit of just $102 to people with no qualifying children — less than a tenth of the average credit for people with at least three children. Many, if not most, of the families who benefited from the CalEITC also likely benefited from other tax credits as well, including the federal EITC and federal child tax credit. 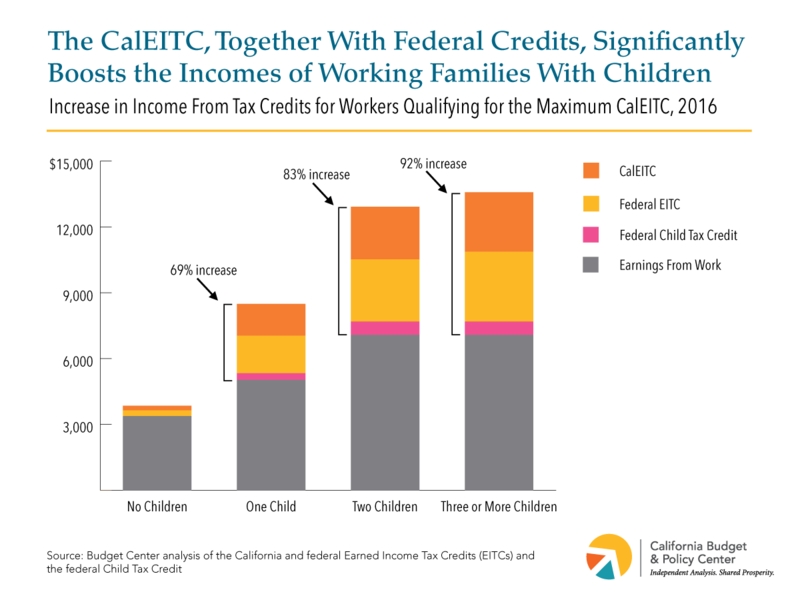 As we’ve pointed out previously, the CalEITC can significantly boost the incomes of working families with children when combined with other tax credits. The CalEITC, together with the federal EITC, lifted an estimated 255,000 Californians out of deep poverty. Before filing their taxes, nearly three-quarters (74 percent) of the roughly 815,000 people who benefited from the CalEITC in tax year 2015 had incomes (reported for tax purposes) below one-half of the official federal poverty line (FPL). (One-half of the FPL, commonly called the “deep poverty” threshold, was about $9,500 for a family of three in 2015.) After receiving the CalEITC and federal EITC, 43 percent of these individuals still had incomes below half of the poverty line. In other words, these two tax credits in combination cut the share of these individuals living in deep poverty by 31 percentage points. Viewed another way, the FTB estimates that around 606,000 people who claimed the CalEITC were living in deep poverty before filing their taxes, and that 255,000 of these individuals were lifted out of deep poverty by the state and federal EITC (351,000 people remained in deep poverty). It is important to note a key limitation of this analysis. The Census Bureau bases its official poverty calculations on more than a dozen sources of income, but the FTB only had access to the income sources reported on state and federal tax returns. This means that the FTB’s analysis excludes important sources of income, such as cash assistance provided through CalWORKs , that would lift additional families out of deep poverty when combined with the state and federal EITC. (The FTB acknowledged this limitation and estimated that a modest amount of cash assistance, in addition to these tax credits, could lift perhaps around 100,000 more CalEITC recipients out of deep poverty, on top of the 255,000 lifted out of deep poverty by the state and federal EITC alone.) A forthcoming Budget Center analysis will build on these findings in the FTB report by using Census data to estimate how many more Californians could be lifted out of deep poverty by the CalEITC if proposals to expand the credit are implemented. While the FTB report helps answer important questions about the CalEITC that will be useful in debates over how to build on the credit, one of the most significant questions remains unanswered: How many eligible Californians missed out on the credit in its first year? Answering this requires knowing how many people are eligible for the credit. But this is not easy to determine because the majority who are eligible for the CalEITC aren’t required to file state income taxes due to their very low incomes. In other words, the FTB can’t simply use tax records to tally up the number of eligible people because many who are eligible probably don’t file. Indeed, our survey suggests that many eligible workers missed out on the credit in its first year because they did not file their taxes. And in testimony at a recent Senate budget hearing, FTB representatives said they believe the CalEITC is undersubscribed, with perhaps around 200,000 families missing out. Given that the CalEITC may be significantly underutilized, how can California maximize participation in future years? Our recent report outlined a number of strategies the state could pursue to raise awareness of the CalEITC, including by extending state support for community-based efforts to promote the credit through a grant program created last year. Also, since reaching “nonfilers” poses the biggest barrier to the credit’s success, state policymakers should consider authorizing state agencies to link administrative data in order to identify people who missed out on the CalEITC because they did not file their taxes, similar to an effort undertaken by Virginia. For example, the Medi-Cal Eligibility Data System (MEDS) could be matched with FTB tax filer data to identify public benefits recipients who likely qualify for the CalEITC and did not recently file. California could then contact these nonfilers directly to let them know that they might be eligible for a tax refund and connect them to free tax preparation services to facilitate their filing. This strategy not only has the potential to boost CalEITC claims, it also could boost participation in the federal EITC. It also would provide an ideal opportunity for researchers to study which modes of contacting nonfilers work best to increase the use of tax credits, providing valuable insights that would inform future outreach efforts. As state policymakers consider proposals to expand the CalEITC, they should also explore strategies for boosting participation in the credit so that as many low-earning workers as possible can reap its potentially wide-ranging benefits.